AveSeena is a new luxury green beauty brand that offers immune-conscious skincare products that are backed by science. It was founded by Dr. Ebru Karpuzoglu, an Immunologist, who spent twenty years studying the effects of estrogenic and endocrine disrupting ingredients on the immune system. 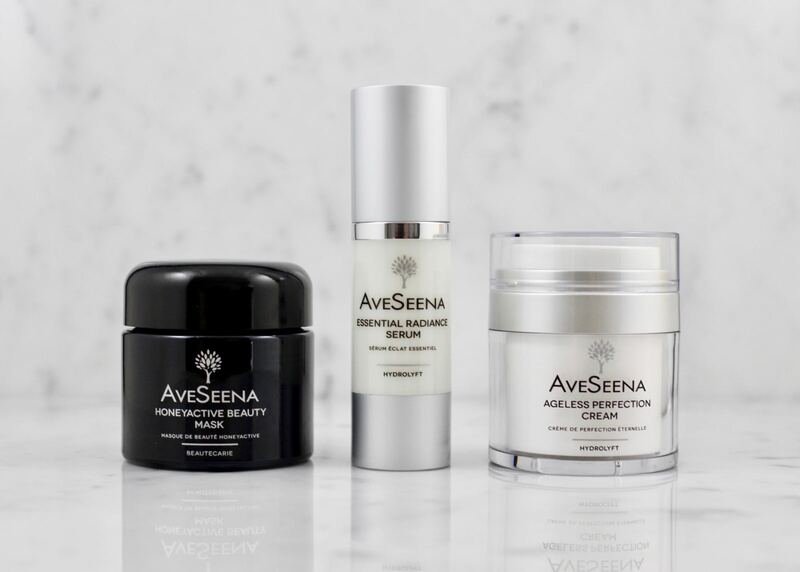 AveSeena strives to provide innovative, 100% naturally-derived skincare that focuses on the well being of the skin as it is the first line of immune defense. AveSeena prides themselves on total transparency and have taken measures to ensure that they are EWG VERIFIED™, Leaping Bunny certified, as well as, PETA Beauty without Bunnies certified. They follow very strict standards in selecting ingredients to use in their formulations and do not use any ingredients that are banned in the U.S., Canada, E.U., or Japan. These 1,700+ harmful ingredients make up their “H-Free List” (the “H” presumably stands for “Harmful”) and do not appear in any of their formulations. Impressive! Also, all of their products are made in small batches and are completely vegan with the exception of one product. AveSeena’s current collection includes two different lines: Hydrolyft, which offers age-defying, innovative, concentrated formulas; and Beauthecarie, which includes aromatic multi-botanical blended formulations. Hydrolyft is currently comprised of two products: their Ageless Perfection Cream and Essential Radiance Serum, while Beauthecarie has only one product in the line: their Honeyactive Beauty Mask. The texture is what I notice the most between the two masks. Both are waterless and thick, but the Honeyactive Beauty Mask is extremely thick. I found it to be sticky but not in The Honey Mud-tacky-sticky-kind-of-way. The best way to describe the stickiness is likening it to super sticky, soft caramel candy. At times I felt that it was hard to apply, especially evenly or smoothly on the skin (more on this after the jump). The Honeyactive Beauty Mask has almost twice as many ingredients as The Honey Mud. While that does not really bother me, some people may prefer products that have simpler ingredient lists. The Honeyactive Beauty Mask also includes coconut oil as its third ingredient which may not be ideal for those with oily / acne-prone skin. The Mask also contains the preservative phenoxyethanol. “Purists” might prefer to avoid that ingredient altogether, but again, it is not a deal breaker for me. The Honey Mud, on the other hand, contains some essential oils, so if you’re sensitive to essential oils, that’s something to keep in mind. Finally, the last factor is the price. The Honey Mud retails for $90 USD, while the Honeyactive Beauty Mask is more affordable at $76 USD. 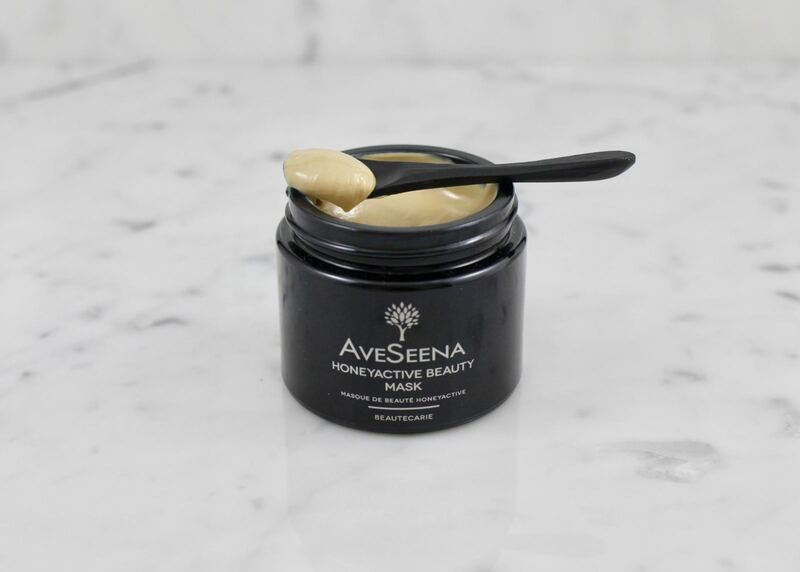 The key ingredients in the Honeyactive Beauty Mask are honey (which I love for its healing, antibacterial properties), China clay (which draws out impurities while providing gentle exfoliation), and cacao absolute (which is a fabulous antioxidant and provides that delicious seratonin-boosting chocolate scent). The other notable ingredients are the castor, camellia, and sunflower oils that provide nourishment and balance to the skin. – Deep Detoxing: Warm the mask between your fingers to soften it, then slather a thick layer on your (dry) face and let it sit for 10 minutes. Wash off with lukewarm water with gentle movements. – Light Mask: Mix a dollop of the mask in your hand with 1-2 drops of water before application and then apply to dry face. Remove the mask with warm water after 10 minutes. – Powerhouse Facial: Add a pump full of the Essential Radiance Serum to the mask and mix well before applying to your (dry) face. Leave on for 10-15 minutes, and then wash off with lukewarm water. I tried all three methods and felt that the results were pretty much the same for all three – my skin felt very smooth, glowly, and tightened after use. I like that the Mask is non-drying and stayed that way regardless of how long I left it on for. I also liked that it washed off relatively easily. The only notable difference was the consistency and moisture level. The ‘Deep Detoxing’ method (which is really just applying it normally) was thicker, stickier, and harder to spread on evenly on the skin. The ‘Light Mask’ and ‘Powerhouse Facial’ methods thinned out the consistency making it easier to apply. My skin felt slightly more hydrated in both cases. After trying both masks for an extended amount of time, I still think I prefer May Lindstrom’s The Honey Mud – it comes down to the texture and consistency. I like The Honey Mud’s thinner, silkier consistency better and that it is not overly sticky (it is more tacky, than anything else). I felt that the Honeyactive Beauty Mask was harder to apply due to the super-stickiness and I didn’t care for the messiness that came with it. What I do like is that I like that the Honeyactive Beauty Mask offers another good option for a honey-clay-cacao-type mask for people, and it’s more affordable, at that. The Essential Radiance Serum was a definite standout for me. The Serum takes the place of multiple serums as it hydrates, brightens, refreshes, and fights against signs of fatigue all in one powerful serum. This oil-free serum is a thick, colorless gel that looks slightly cloudy in appearance. While it is a thick gel, I love that it is lightweight and that it has a nice slip to it. Depending on what you apply it over, it may pill a little, but overall it sinks in fairly quickly. The Serum is supposed to have an aromatic cucumber / chamomile / rose scent, but I could only detect a slight rose scent. It is very very faint and at times I don’t smell anything at all. 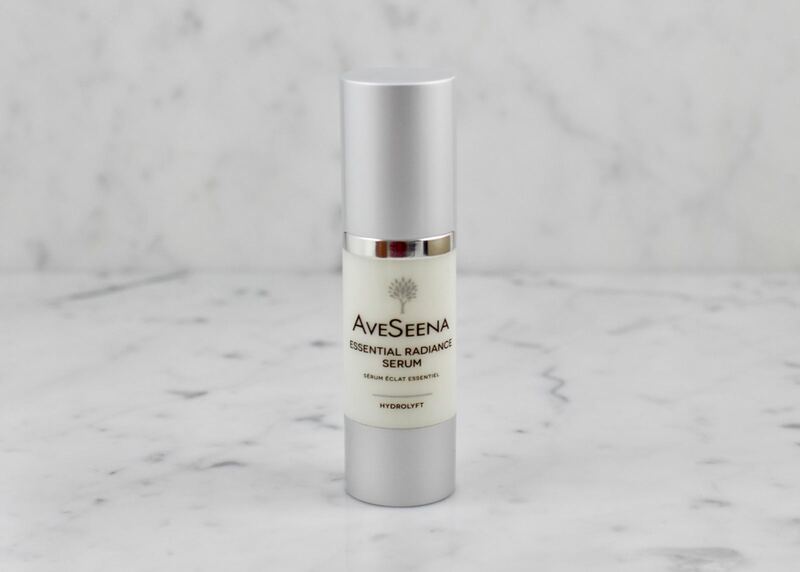 The Serum is one of the more innovative / technologically-advanced products that AveSeena carries and it has an impressive ingredient list to boot. Its formulation even includes adaptogens (reishi mushroom, ginseng, and licorice extracts) as a nod to Traditional Chinese Medicine (TCM). The inclusion of these ingredients piqued my interest immediately as I am a huge fan of products that incorporate TCM and / or adaptogens. I was happy to see that aloe is the Essential Radiance Serum’s second ingredient because I’ve had great success with aloe-based serums and moisturizers. They work incredibly well for my only / acneic skin as they provide much-needed soothing hydration. Some of the Serum’s other key ingredients include: rose hydrosol for its moisturizing and comforting properties; globe daisy stem cells that help provide a radiant glow; vitamin B3, an antioxidant that protects the skin against free radicals caused by UV and environmental pollution; and AveSeena’s botanical humectant complex that serves as a botanical alternative to hyaluronic acid. The Serum also includes phenoxyethanol (it appears that all of AveSeena’s products include this preservative) which could be problematic for those who like to avoid this ingredient completely. AveSeena describes the Essential Radiance Serum as a “targeted fast-acting serum” and I would have to agree. After cleansing and toning, I would use two to three pumps day and night (as directed by the brand), and after only a few uses I noticed a remarkable difference in my skin. My skin had been looking dull for some time, and after I had used the Serum several times, my skin felt hydrated, supple, soft, and I had a radiant glow. One thing to note is that the Serum may cause a mild (temporary) tingling sensation upon application, but luckily I did not experience any reaction of any kind. Again, phenoxyethanol is included in the formulation, and the Cream also includes the controversial natural preservative Lonicera Japonica (Honeysuckle) Extract (not a deal breaker for me, but may not be ideal for “purists”). Day and night, following the application of the Essential Radiance Serum, I would apply a healthy dollop of the Ageless Perfection Cream to my face and neck. The Cream is quick-absorbing and sinks into my skin beautifully. I love its non-greasy, silky texture and how soothing and nourishing it feels on my skin. It makes my skin feel baby soft almost instantly, and I can’t help but to touch my face. After using the Cream for several weeks (in conjunction with the Serum), my skin is smoother, plumper, and more supple. Some of the fine lines have diminished and my face looks brighter, more youthful, and awake! Love! My only gripe about the Cream is the packaging. I’ve seen other brands use similar packaging for their moisturizers (like Drunk Elephant’s Lala Retro Whipped Cream), but I find it hard to use especially when it comes to controlling how much cream you want to be dispersed. While I appreciate and understand the need for a pump, I think a pump with more practical packaging like their Essential Radiance Serum’s would be a lot better. Cucumis Sativus (Cucumber) Fruit Water, Aloe Barbadensis (Aloe Vera) Leaf Juice, Water, Glycolic Acid, Glyceryl Stearate, Cetearyl Alcohol, Carthamus Tinctorius (Safflower) Seed Oil, Palmitoyl Tripeptide-3, Niacinamide (Vitamin B3), Cassia Angustifolia Seed Polysaccharide, Silk Protein Amino Acids, Stearic Acid, Helianthus Annuus (Sunflower) Seed Oil, Glycerin, Isopropyl Palmitate, Globularia Cordifolia Callus Stem Cell Extract, Cocos Nucifera (Coconut) Oil, Squalane, Methylsulfonylmethane, Theobroma Cacao (Cocoa) Seed Butter, Tocopheryl Acetate, Sodium Ascorbyl Phosphate (Vitamin C), Simmondsia Chinensis (Jojoba) Seed Oil, Ubiquinone, Vitis Vinifera (Grape) Seed Oil, Mahonia Aquifolium (Oregon Grape) Root Extract, Camellia Sinensis (Green Tea) Leaf Extract, Persea Gratissima (Avocado) Oil, Euphrasia Officinalis (Eyebright) Extract, Helichrysum Italicum (Helichrysum) Flower Oil, Glycyrrhiza Glabra (Licorice) Root Extract, Calophyllum Inophyllum (Tamanu) Seed Oil, Borago Officinalis (Borage) Seed Oil, Linum Usitatissimum (Linseed) Seed Oil, Oenothera Biennis (Evening Primrose) Oil, Rosa Canina (Rosehip) Fruit Oil, Panthenol (Vitamin B5), Arnica Montana (Arnica) Flower Extract, Lavandula Angustifolia (Lavender) Flower Extract, Calendula Officinalis Flower Extract, Matricaria Recutita (German Chamomile) Flower Extract, Macadamia Ternifolia Seed Oil, Rosa Damascana (Rose) Absolute, Centella Asiatica (Gotu Kola) Extract, Geranium Maculatum (Wild Geranium) Extract, Taraxacum Officinale (Dandelion) Extract, Equisetum Arvense (Horsetail) Leaf Extract, Lonicera Caprifolium (Honeysuckle) Flower Extract, Lonicera Japonica (Honeysuckle) Extract, Decyl Glucoside, Glyceryl Caprylate, Phenoxyethanol, Ethylhexylglycerin, Sodium Carbomer, Sodium Hydroxide. AveSeena is a unique brand and I love that their products are backed by science. I appreciate the fact that they try to create innovative, technologically-advanced formulas as those types of products have been a big interest of mine lately. The brand uses a lot of great ingredients in their formulations but I’m a bit surprised that phenoxyethanol can be found in all of their products when they go as far as to excluding 1,700+ harmful ingredients anyway. I realize that the amount / concentration of the phenoxyethanol is probably minimal (otherwise it’d be banned for sure, according to Japan’s Standards of Cosmetics, whose standards they abide by), but it is still included in their formulas and INCI lists. I don’t mind phenoxyethanol personally, but others may be hesitant to try the products because of it. The star products for me were definitely the Essential Radiance Serum and the Ageless Perfection Cream. These are two of the only three products AveSeena has in their collection right now, so I’m assuming that they have some new creations up their sleeves. I’d be curious to see what other products they come out with, especially for their Hydrolyft line! 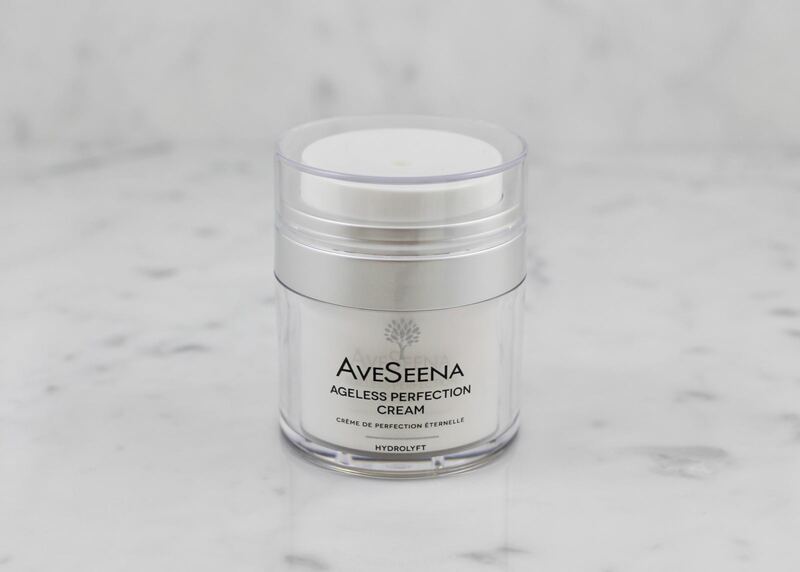 If you are interested in purchasing any of AveSeena’s products, you can purchase them directly from their website. The AveSeena products were kindly provided for consideration, however all opinions expressed are my own. This post contains no affiliate links.